Q: What exactly happened with the bombs to make the small town suburb setting one of the few places spared? Q: Why was Scottie peeing bright red in the bathroom sink? This is one of those films that is very draining to watch, but worth it. It is a slightly more tame approach to the subject matter, but excellently done. It is often compared with "Threads", which many people think is too graphic. Regardless, I like both films. I have to say that "Testament" will look more realistic to rural people, who may just die slowly as the characters in this film do, rather than be subjected to the immediate effects of the attack. Rebecca De Mornay's appearance in this film, which I only saw after seeing "By Dawn's Early Light", makes a connection between these two films. Everyone should see both films at least once, as well. Excellent performances from Rossie Harris and Mako make this film stand out even further. 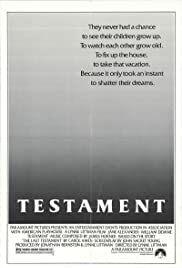 Having seen "The Day After" now, I prefer "Testament" but find both films excellent.